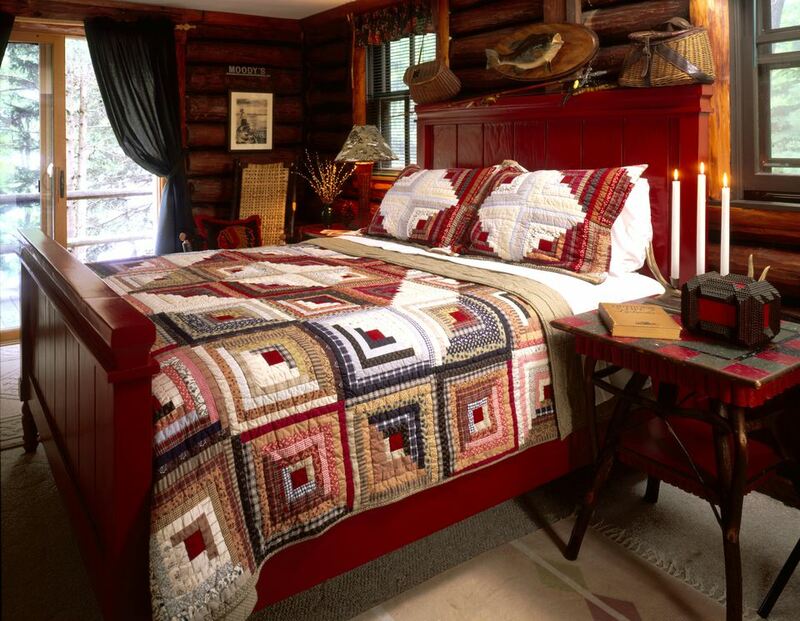 Have fun browsing the quilt layouts in this Log Cabin quilts photo gallery. You'll find related quilts, too -- Pineapple quilts and others of similar design. Most of the quilts in the gallery were sewn by members of an online quilting community and each quilter had a few words to say about her project. Traditionally, Log Cabin quilt blocks are designed with a light half and a dark half, with the division running along each block's diagonal. The differences in color value make it a cinch to create an endless number of layouts by turning blocks around when you use a design wall or other flat surface to preview a quilt. The quilt shown on this page is a traditional Barn Raising Log Cabin design. Blocks are oriented so that light areas flow together at the quilt's center to create a square that appears to be on point, even though blocks are sewn side by side in a straight setting. Remaining quilt blocks are turned to create the continuous look of squares within squares. The contrast can be shifted by placing the dark halves of blocks in the quilt's central area. Log cabin quilts are sometimes made using foundation piecing techniques, but they can also be sewn piece by piece without the help of foundations. Sunshine and Shadows is a popular Log Cabin quilt design. Look closely at the photo and you'll notice that the design is created when four quilt blocks are clustered together into two rows. Light sides touch in each row of two blocks. The four-block layout continues throughout the quilt. This Log Cabin is a lovely example of a scrap quilt. Here is another example of a barn raising log cabin quilt. Canadian Quilter Says: I had a huge fabric stash about five years ago and wanted to pare it down. I decided to see if I could make an entire king-size quilt for our bed without buying any new fabrics. I used 2" strips of fabric to assemble the quilt. The ​quilt backing is pieced and made from 10" scrap blocks. The only fabrics I purchased were the borders. Melissa turned her Log Cabin blocks into a medallion quilt. Melissa Says: I used three different machines to make my log cabin quilt blocks, and when it came time to put them together, they were all different sizes. I had to pick out the ones that were about the same size (with the same amount of strips in them). I didn't have enough, so I made a panel for the middle of the quilt. I used fabric paint and cut maple leaves out of hand dyed muslin. Next, I tea-dyed the muslin and sewed the maple leaves onto its center, using applique for the stems, and zig-zag stitches around the leaves. Sheilago Says: I made this quilt in the spring of 2009 for my teenage daughter. In December, she began snuggling under the Christmas tree quilt I made and missed doing that after Christmas had passed. I created this quilt by modifying a design by Jean Ann Wright which was shown in Quilt magazine. I added a Country Cottage block from Country Quilt, plus extra log cabin squares and heart applique. This was my first attempt at hand quilting. Momof11 Says: I made this Barn Raising Log Cabin quilt from 6" log cabin blocks received in a swap on the Quilting Forum. The quilt finishes at approximately 65" x 80". Rich the Quilt Man Says: My quilting hobby began when the ceramic shops all closed in our town. I had to have something to keep my hands and mind busy. My mom showed me some simple steps to paper piece and I took off from there. She also helped me sash and bind this 95" x 95" queen size quilt. The completed quilt now graces our Pastor's bed. She said she would never part with it. Anita/NYC Says: My pineapple quilt measures 38" square, originally with a paper pieced border. The 10" finished blocks were not foundation pieced. I used my method of rotary cutting squares of fabric into perfect patches without wasting any fabric. Professionally quilted by Janice Petre, Sinking Spring, PA in 2009. Lisa Jo Says: This miniature pineapple quilt measures 20" X 20", and was created for a swap online. The recipient is fond of pineapple and log cabin quilts but said to make whatever I wanted, so I took her favorite pattern and made it wonky. The quilt now resides in France. Beverly Says: Janet, first seeing this quilt I really liked it, but I got impatient for the pattern. Then I saw the book on Amazon, bought it and made this quilt. I did tweak it a little to eliminate the triangles on the sides and corners. Mine is the lazy way, not on point. I also used the pitcher and bowl in silhouette and decided to leave it that way. I hope you like my version of your cute quilt. Note from Janet: I love Beverly's quilt! Take a look at the original quilt pattern. Do you see other ways to alter its layout? Start looking at quilt patterns with an eye to how they can be changed and you'll discover lots of ways to tweak designs to suit your own tastes. Elaine Says: This is one of my favorite quilts. The pattern is from the Simply Quilt show opening. I love the bright colors against the sparkly black fabric. I paper pieced the quilt, which isn't something I normally do because I tend to cut my fabric patches too small. Margaret Says: This king size quilt was a wedding present for our niece. The quilt was more of a challenge than I thought, so I was glad I began sewing early, and I didn't finish until 3 days before the wedding -- talk about cutting it close. The first three block sets (24 each) seemed easy, and I thought: I have to make one for myself. About halfway through this quilt, I told myself I was totally nuts. The pattern design is by Jackie Robinson of Eureka, MT, and The Quilt Studio in Omaha, NE did the quilting. Robicole Says: I was inspired to make this quilt for a friend when I saw what fun they were having in a swap for these little log cabin blocks. Janice Says: This quilt was sewn using a Confetti Log Cabin quilt pattern. I made it for my friend Annie's birthday to thank her for teaching me to quilt. The quilt measures about 74" x 96". I machine quilted red roses in the white areas. Janice's quilt blocks are arranged in a Fields and Furrows layout. Tara Says: This is my third quilt. It measures approximately 50 x 50 inches, with nine log cabin blocks surrounded by borders. The block piecing was free-form, and I like how it turned out. T-Marie Says: I loved the Lazy Grrrl's log cabin in your quilt show so I had to make one for myself. My quilt is sewn in Christmas colors and measures 46" x 55". Thanks for having the quilt show -- it is very inspiring. Dee Says: This quilt was sewn using an offset pineapple block from Rich Traditions. It makes your eyes jump a bit but I enjoy looking at it. The quilt started out to be larger to get the circular effect of the pattern, but looking at it on the design wall, I decided it would be overwhelming to increase the size. Dee Says: I made this Barn Raising Log Cabin quilt for my sister. Kate Says: This quilt top resulted from a block swap I hosted. Each person chose the accent colors of her blocks and we swapped two blocks each. Log cabins are among my favorite traditional quilt blocks. Tartan Says: This queen size quilt is made from Star Flower blocks that I won in a block exchange the quilting forum. I alternated the blocks with courthouse steps blocks to make a large quilt.